Home / Cute Cat Blog / 5 Ways to Keep Your Indoor Cats Entertained! 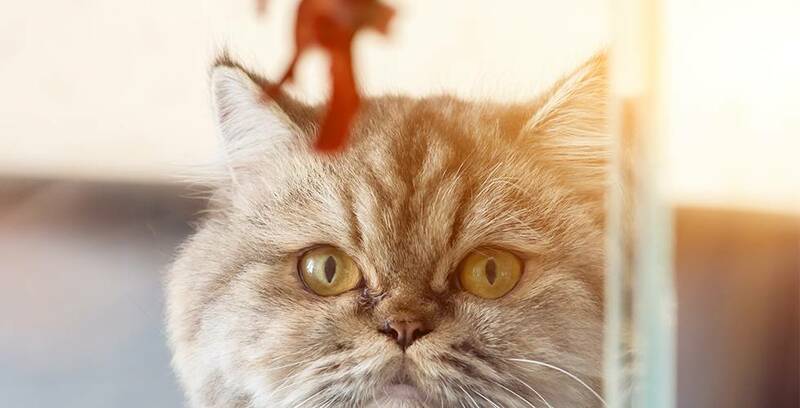 5 Ways to Keep Your Indoor Cats Entertained! As a fur parent, leaving our fur babies home alone is always a bit of a struggle. But rest assured that your indoor cats can have plenty to keep them occupied during the day... In between many magnificent catnaps that is! Growing a potted plant garden for your indoor cats is rewarding for you and your precious puddas! Pick a sunny spot in your house or cat enclosure and place a few pots of your cat’s favourite and safe plants. 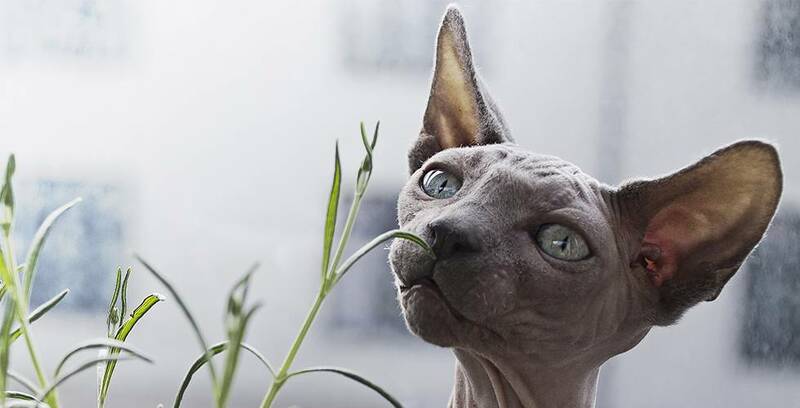 It looks good, smells good and IS good for both you and your cat’s health! Make sure you plant them in pots shallow enough for your cat to reach the foliage. Have a peek at our guide to plants your pudda will love here. 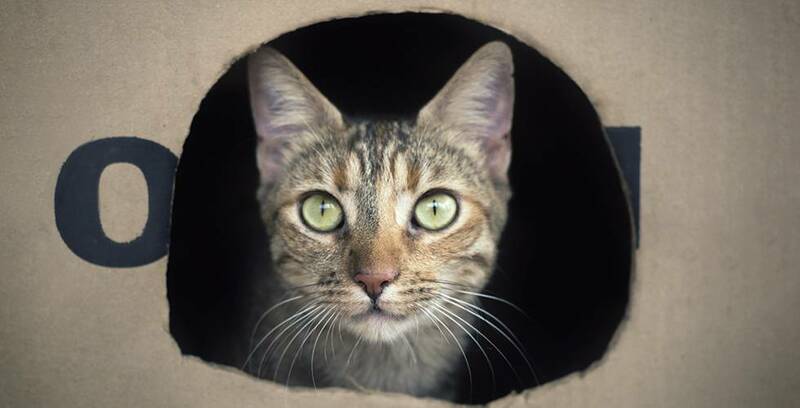 Every cat lover knows, a cardboard box is an opportunity for play - not rubbish! One minute it’s a Fits ‘n’ Sits hidey-hole and the next IT IS TIME TO DESTROY IT. Raid your recycling and give your Queen or King Tom a castle of cartons to rule over while you are away for the day. For more top tips on toys have a peek here. 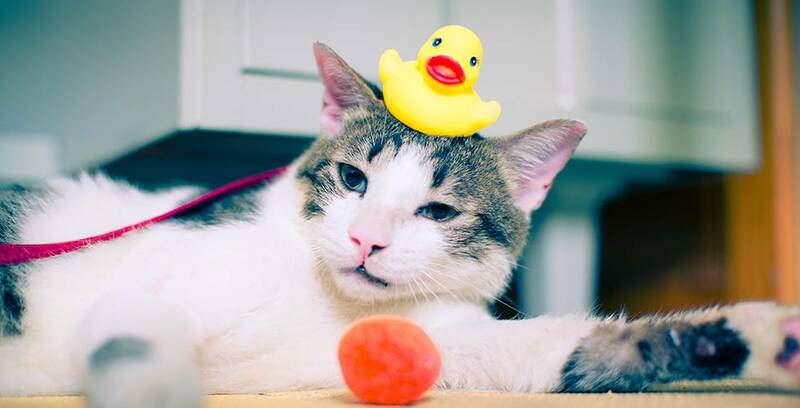 Give your indoor cats the adventure of a lifetime by hiding scented cat toys around your home. The scent will encourage kitty to explore and discover treasures, keeping them entertained for a good amount of time. Experiment with different scents to see what your cat responds to best and use them sparingly so the hunt will be novel for your cat. We suggest trying catnip or valerian. Be sure to keep a treasure map for hoomans to refer to, so you don't lose a toy to the couch monster. Why should hoomans have all the fun of having a pet? Your indoor cats will be mesmerised by a fishy “friend”. Make sure you have a sealed and stable aquarium for this one, no glass bowls on the counter please, that’s just too much temptation for a kitty to handle! Just as they love to chirp at birds from the windowsill, your pudda will delight in watching their aquarium mate. If your kitty is too frisky for real fish friends then a DVD of looped fish or bird footage will satisfy their hunting spirit. 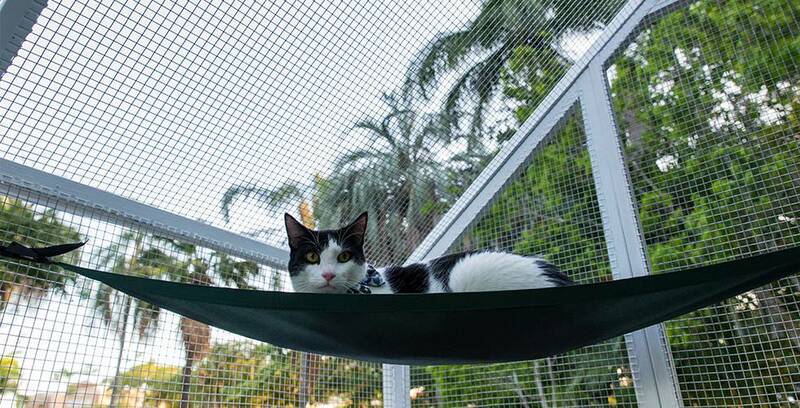 Giving your indoor cats access to the great outdoors has many benefits. But first and paw-most, your kitty needs to be safe from the many dangers that lurk beyond the garden fence. We want to give our puddas the comfort and security of indoors, outdoors! An outdoor cat enclosure gives your cat space to play, keeps them happy, mentally stimulated and healthy and protects wildlife from your fur baby’s hunter instincts. Find out more about how an enclosure is best for your cat here. Keep on purrin’! Join the Backyard Cat Enclosures Furmily on Facebook, Pinterest and Instagram!